【HAMMOCK WITH MOSQUITO NET】Mosquito nets and hammocks combined, keep you well away from its harassment.The mosquito net also has loops around the hoop circle so you can add ropes to extend the net away from your body. 【2 WAY FOR HAMMOCK USE 】Set up with pop up mosquito net to avoid any disturbance from mosquito, bugs, files, insect;raw out the 2 pop up bars, rotate the hammock 180° to place the mosquito net under the bottom and use it as a normal tree hammock. 【COMFORTABLE & HIGH QUALITY】 Unfolded dimensions: 275 cm long (108 inch) -145cm wide (57 inch), fitting 2 adults comfortably.Super strong, it can hold the weight up to 600pounds(lbs), also it can be used for years due to the durable materials. 【SUPER CONVENIENCE】 Lightweight: 38 oz. easy for travelling.24 hours friendly customer service,1 year warranty. 100% refund if there is any quality problem. Feature High density yard,avoid the mosquito coming into it. Breathable hammock fabric,lightweight to take. Storage bag attached to the hammock ,convenient and multifunctional. It is like a airship when you lie in it! Easy Setup Newdora hammock with pop up insect net design, no need to waste your precious outdoor time to set up the net with complicated ropes. Takes a few minutes to setup and enjoy your travel and camping. If you have any problem please contact us. We love our customers, we will provide the best service for customers. 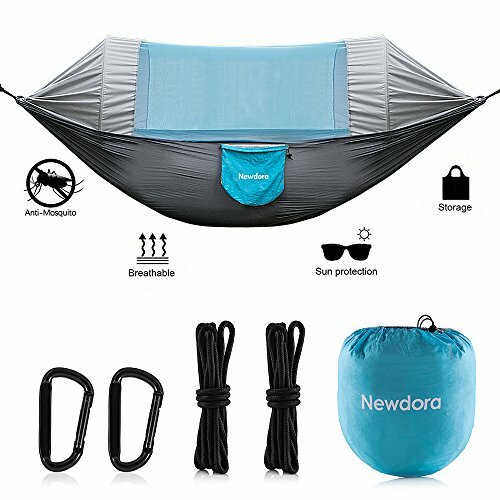 Package Included 1 * Mosquito Hammock with storage bag 2 * Steel Clips 2 * Hammock Ropes Everything you need is included! Enjoy the hammock ,enjoy the nature,enjoy your life!